This simple and elegant ring features a round center stone with diamonds and chevron cut outs along the shank. 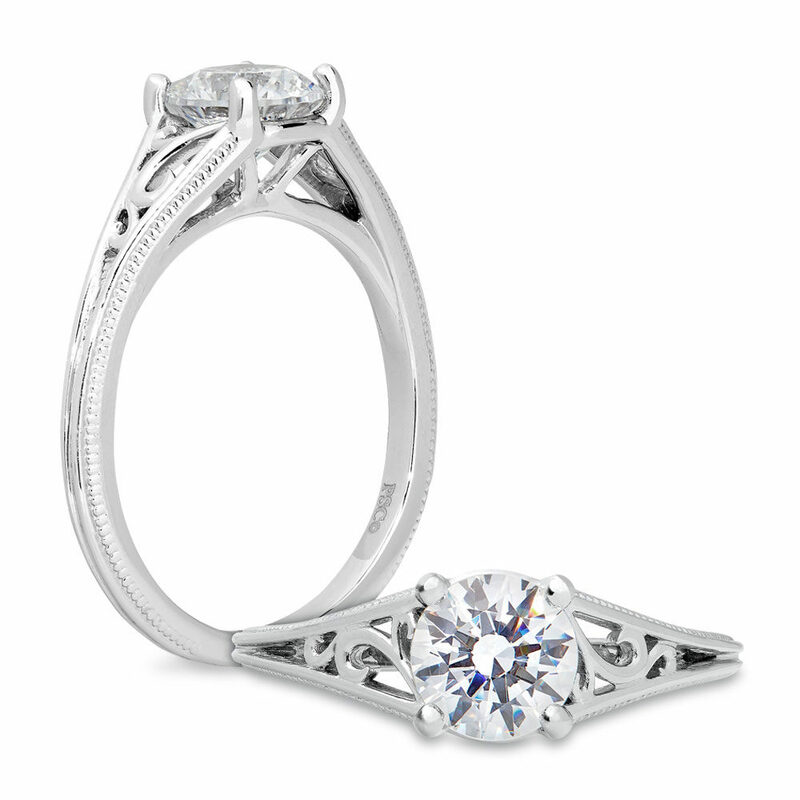 Delicate designs along the shank and under the head mark this as a Peter Storm design. 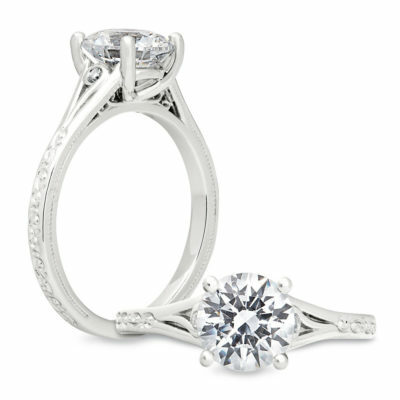 An excellent price point for your center. A solitaire head with a round stone, the shank is filled with filigree patterns. 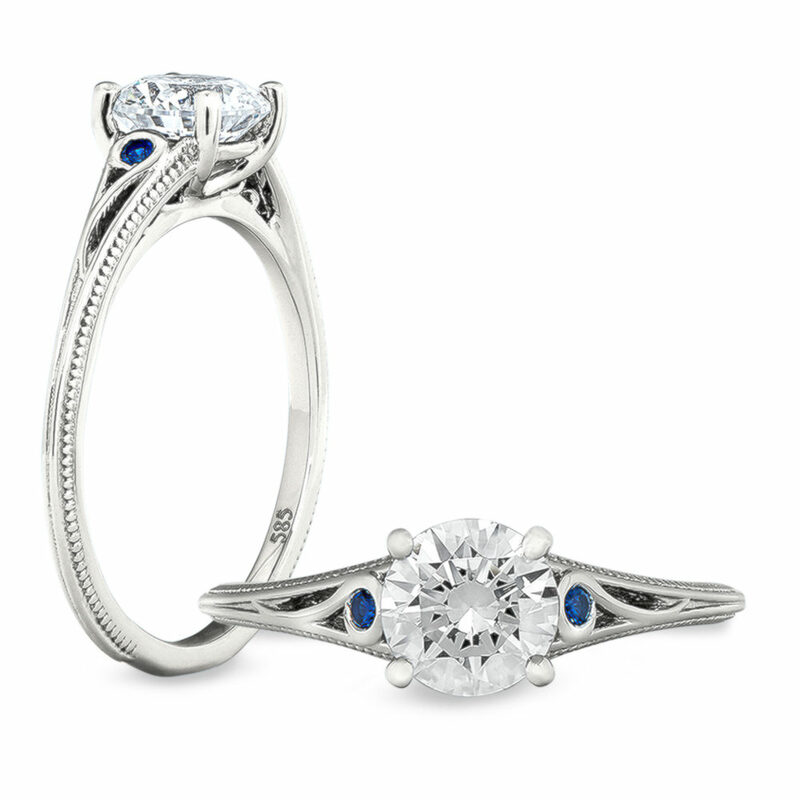 Available with blue sapphires on each side of the center. 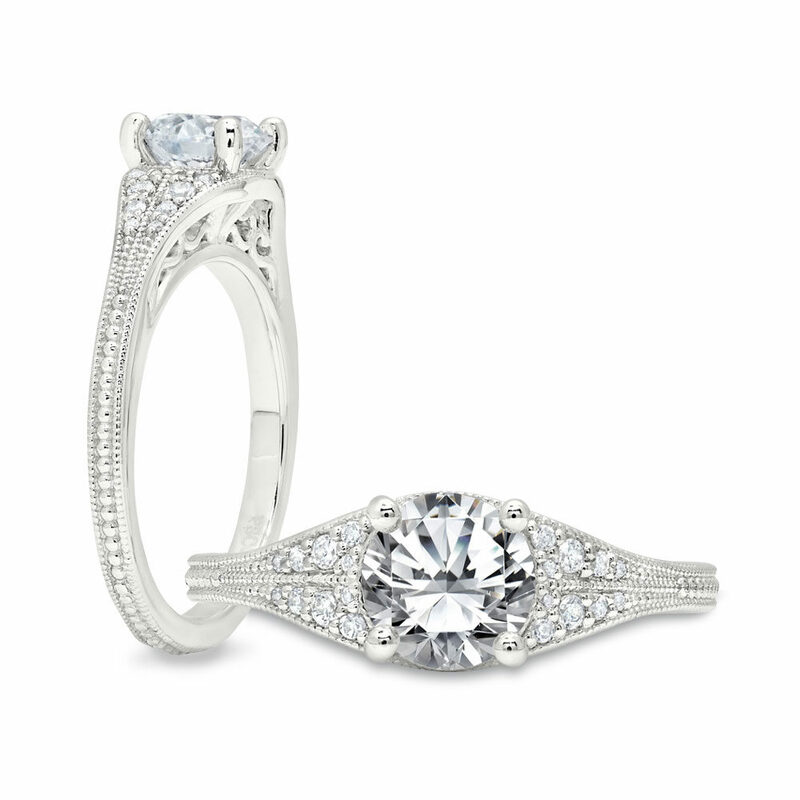 Elegant solitaire. Delicate details under the head, milgrain detail on the band. One of Peter’s favorite rings. A striking piece, it features the center stone floating in the basket of diamond supports surrounding the center. 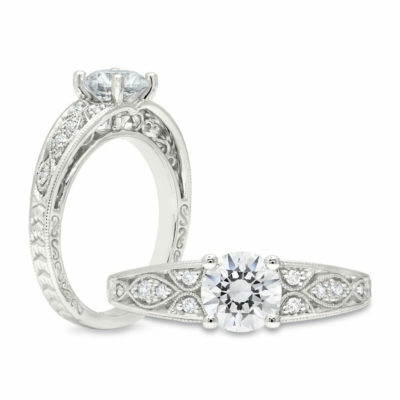 Can be worn with a flat band. A graceful knife edge shank that leads up to an elegant head. Your center will look incredible in this ring. A simple but elegant band, it features a solitaire head with shoulders featuring 3 diamonds. 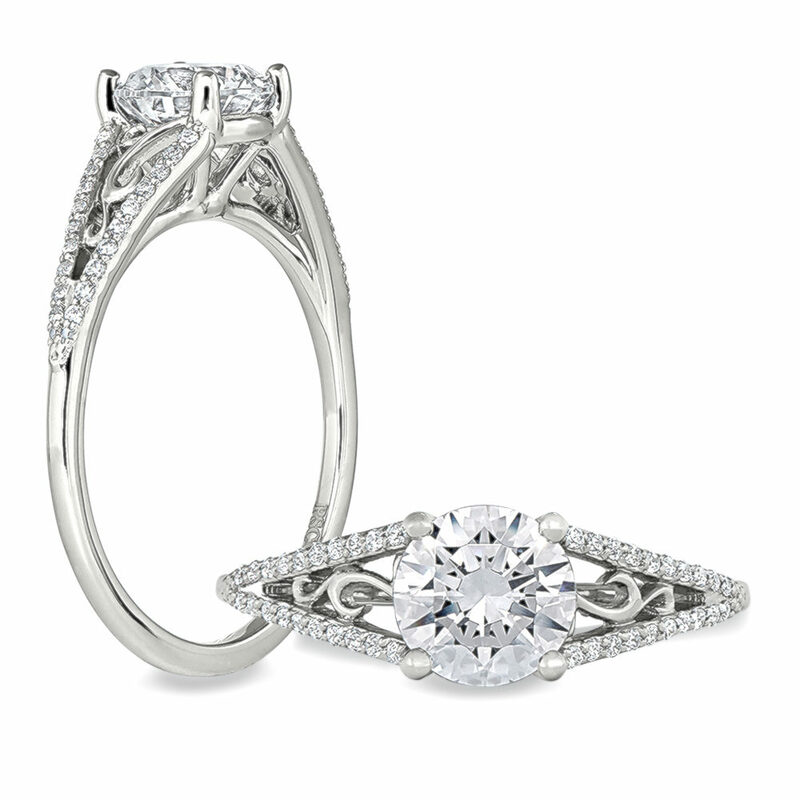 A thin band makes the most of your center. 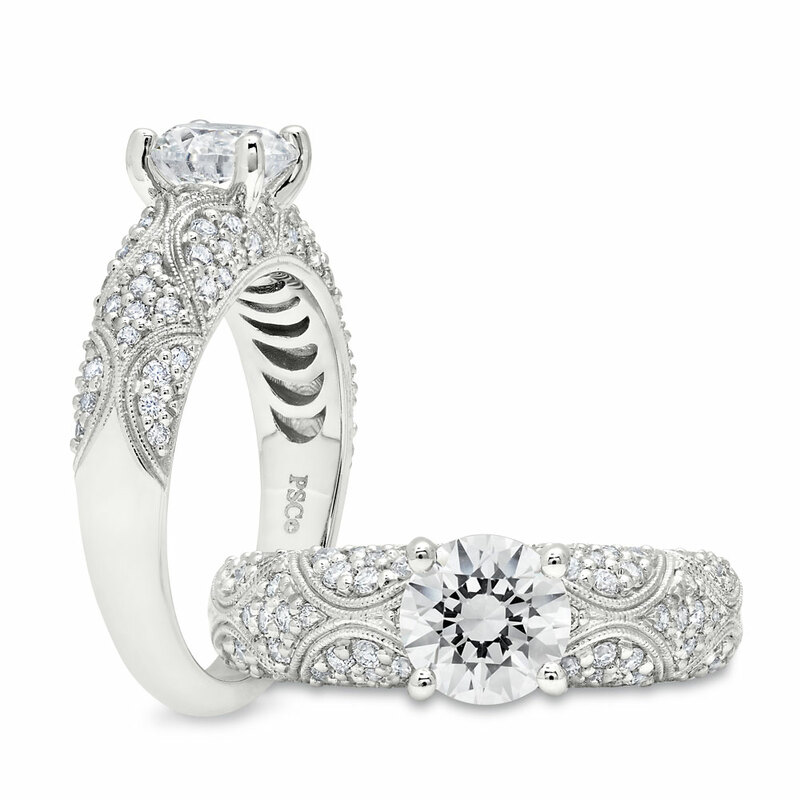 The intricate detail seen only from the side is a trademark of Peter Storm. A simple but elegant band with a solitaire head with the shank featuring a scroll work detail. A thin band makes the most of your center. 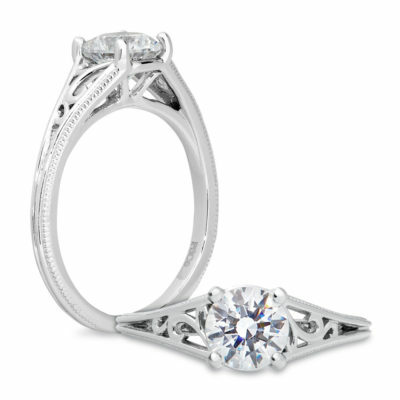 The intricate detail seen only from the side is a trademark of Peter Storm. A simple but elegant band, it features a solitaire head with the shank featuring 3 diamonds. 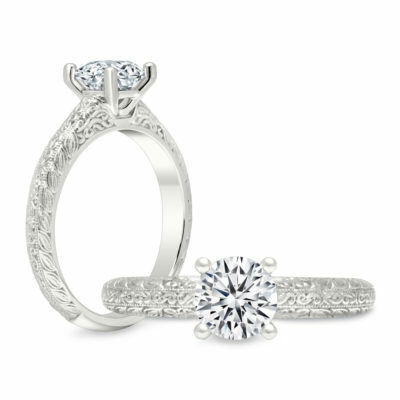 A thin band makes the most of your center. 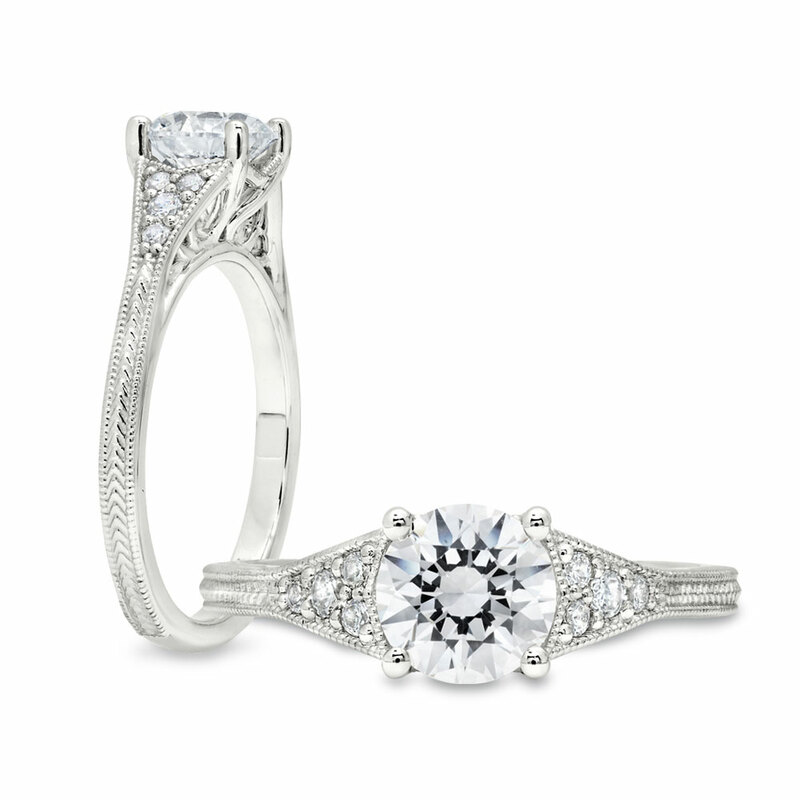 The intricate detail seen only from the side is a trademark of Peter Storm. A swirl pattern caught between two rows of diamonds. 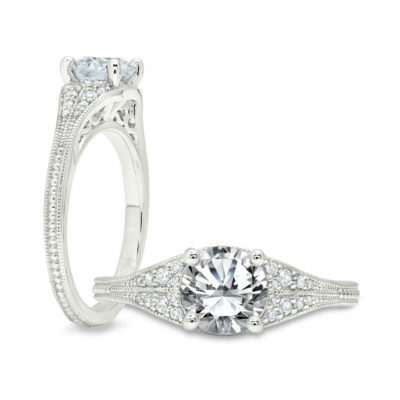 Elegant and fun, great for a .75 – 1.5 ct stone. This ring features a beautiful profile and a graduated band, focusing the eye on your center stone. 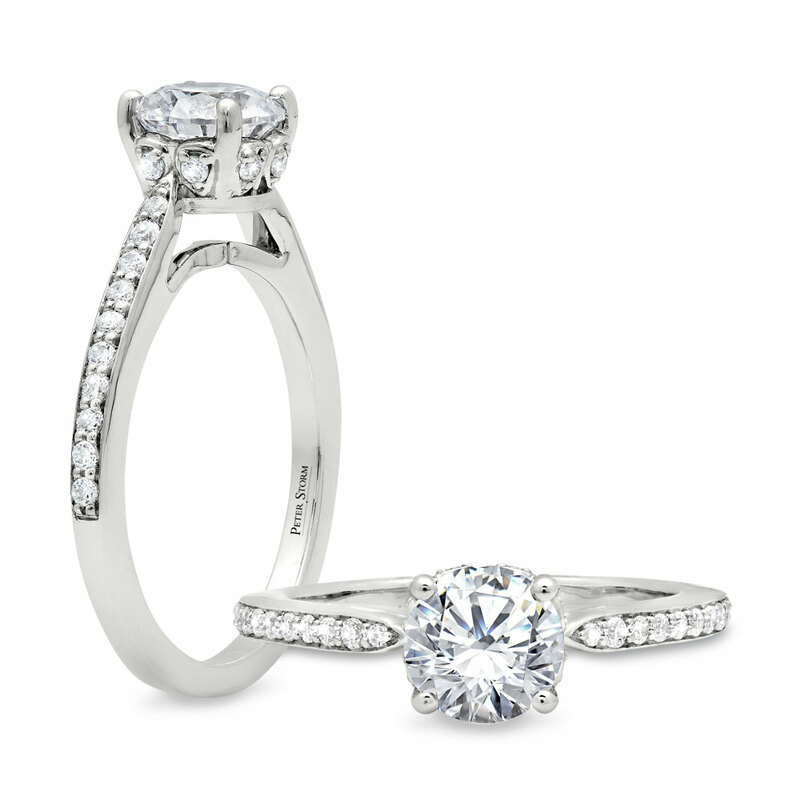 Clean and elegant, this ring makes the most of your diamond. 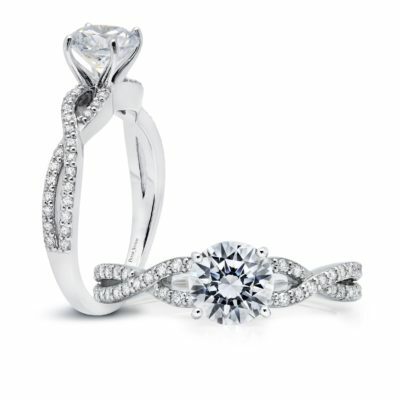 Featuring the infinity twist, this charming take on a solitaire makes the most of your center. 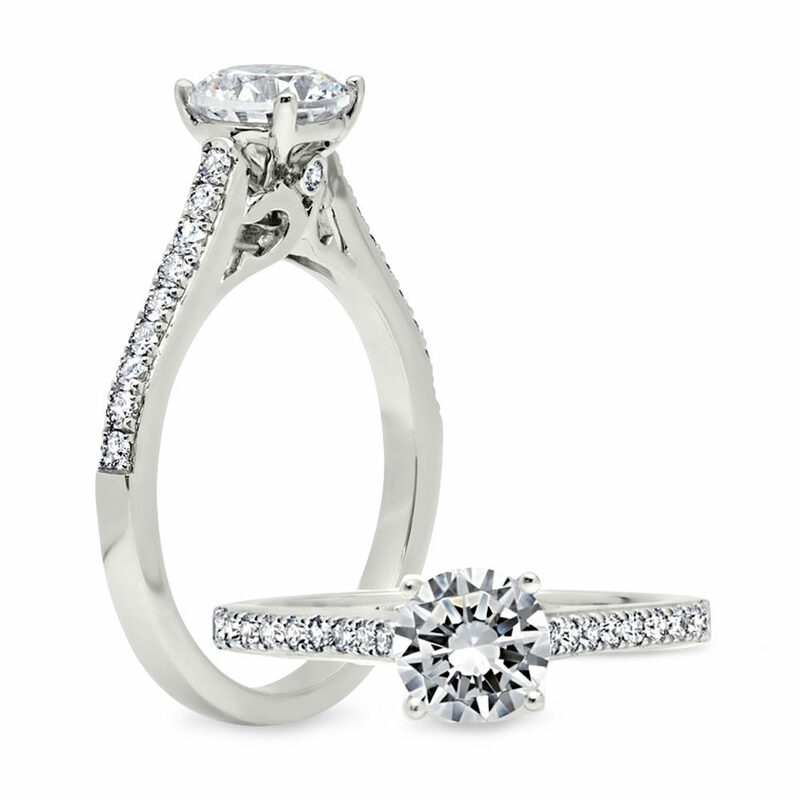 An uncluttered design make the diamonds stand out and shine. Peter’s take on a dramatic solitaire, this ring features delicate designs around the head. 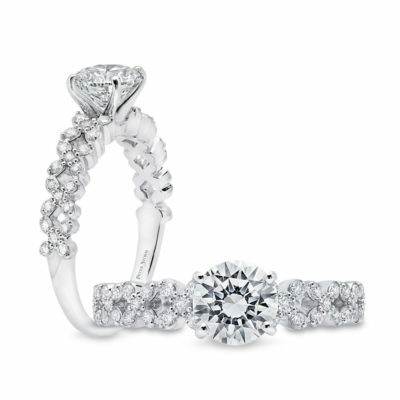 Diamonds sparkle from every angle. 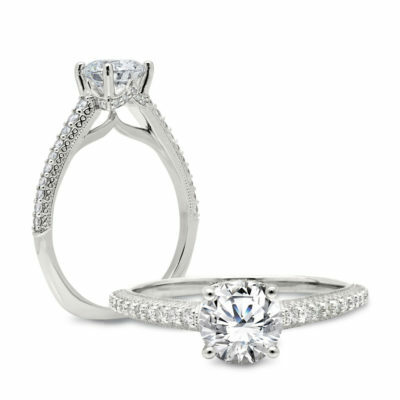 Three rows of diamonds sparkle on the band. 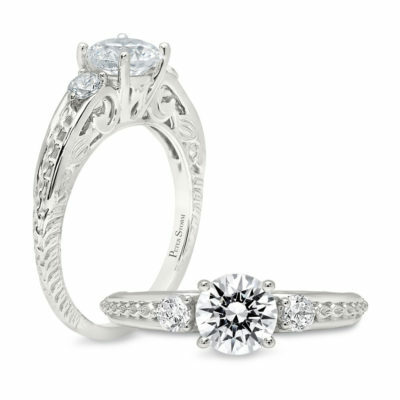 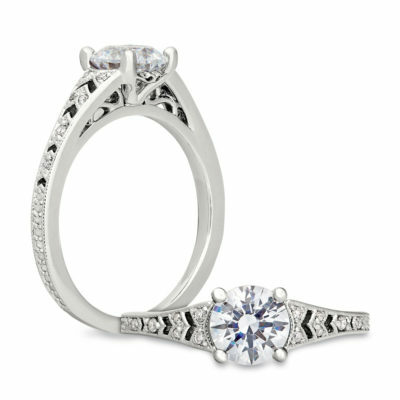 A solitaire head with a round stone, the shank is filled with filigree patterns to add beauty to this price point piece. A solitaire head with a round stone, the shank is filled with diamonds and metal details to create fun whimsical shapes. A simple but elegant band, it features a solitare head with shoulders pebbled with diamonds. 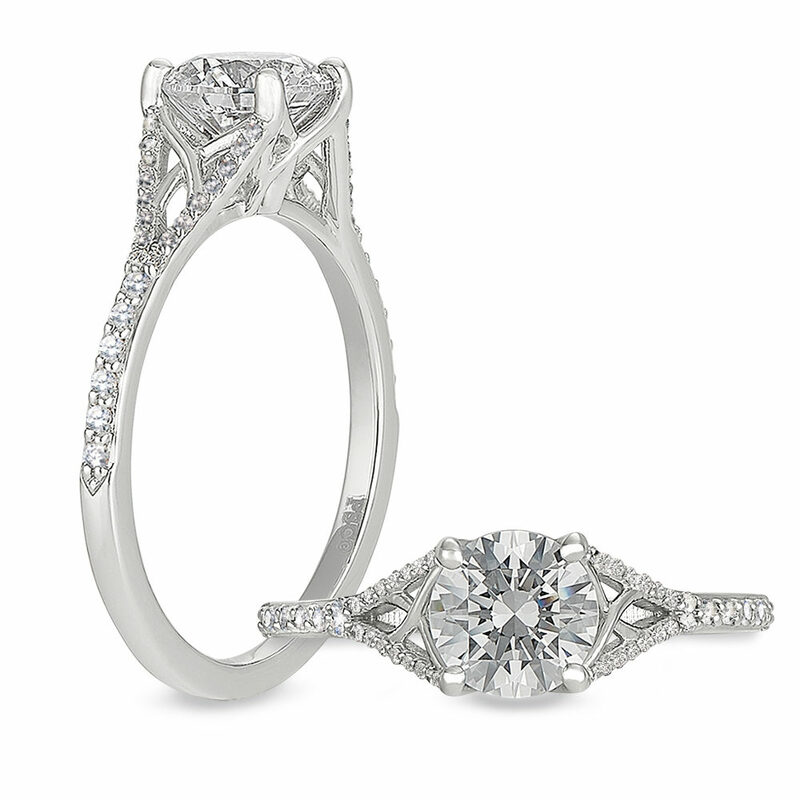 The intricate detail seen only from the side is a trademark of Peter Storm. Utterly romantic, this ring is Peter’s uses engraving to create an antique inspired solitaire. 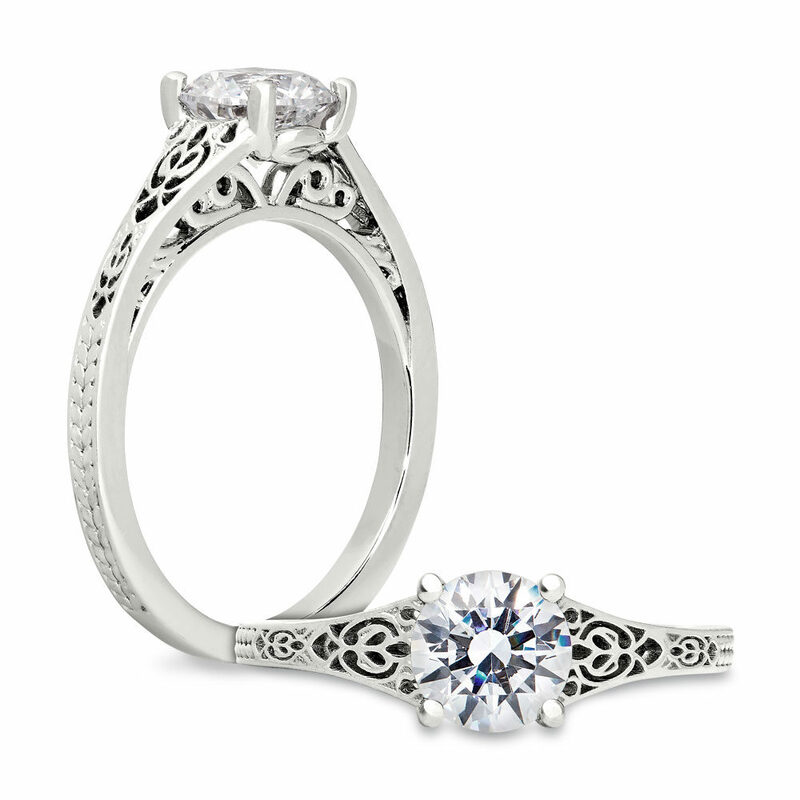 Delicate designs along the shank and under the head mark this as a Peter Storm design. 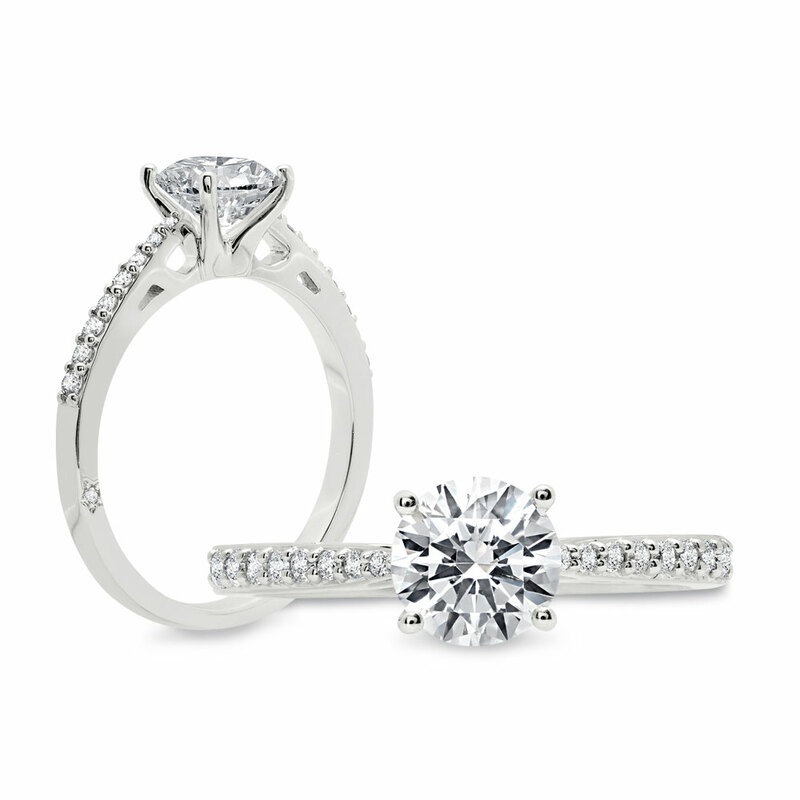 An excellent price point for your center. 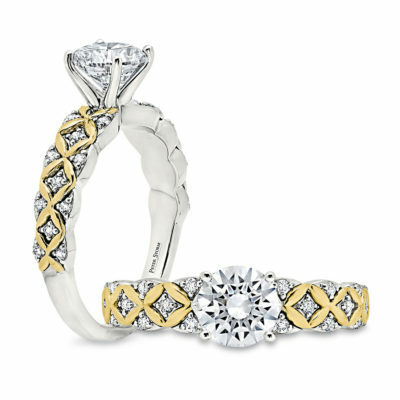 Twisting lines of gold lace up to the center. With no stone, this is a great ring for a budget. Beautiful in rose and yellow gold. This simple and elegant ring features a round center stone with diamonds and chevron cut outs along the shank. 1ct version and 3ct version. Edwardian style solitaire. Engraving scattered with diamonds. A simple but elegant band, it features a solitaire head with shoulders pebbled with diamonds. The intricate detail seen only from the side is a trademark of Peter Storm. 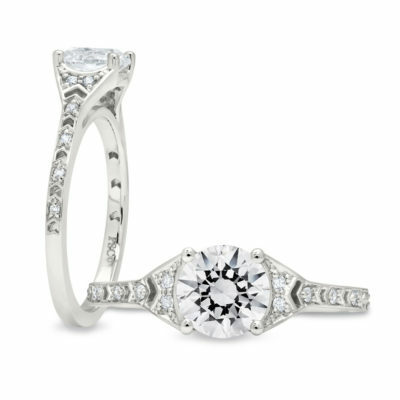 This solitaire features diamonds that spill down the shank of the ring, which graduate toward the center, highlighting your special stone. 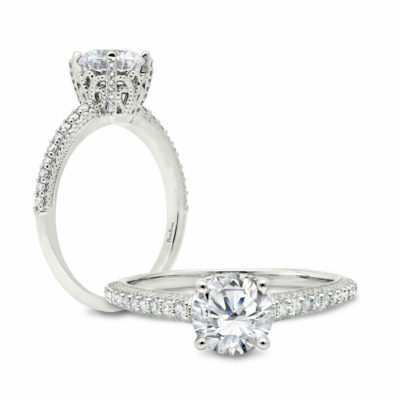 Featuring the Whisper Halo, this head features a crescent of diamonds that span each edge of the diamond. This ring has diamonds sparkling on every surface. 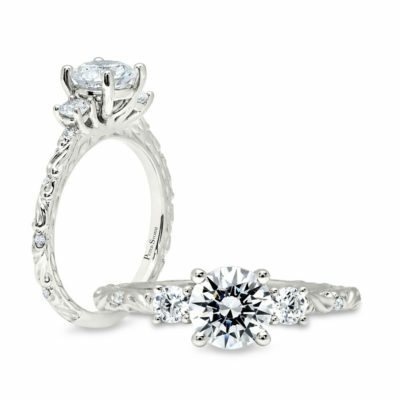 One of Peter’s most intricate and romantic pieces. Swooping migraine is interspersed with small round diamonds. 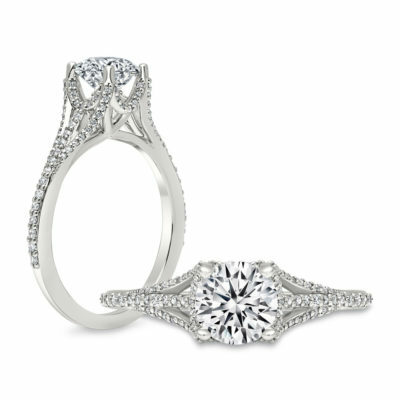 Featuring engraving that wraps around a knife edge band. 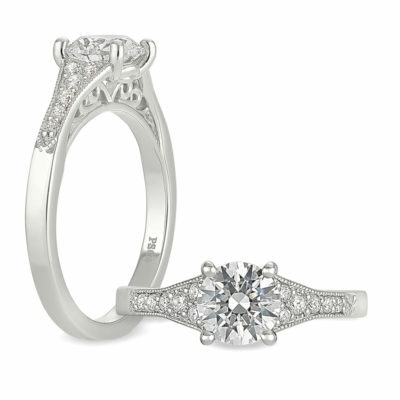 Special detailing on the head create a beautiful profile on this ring. Available with Blue Sapphires. 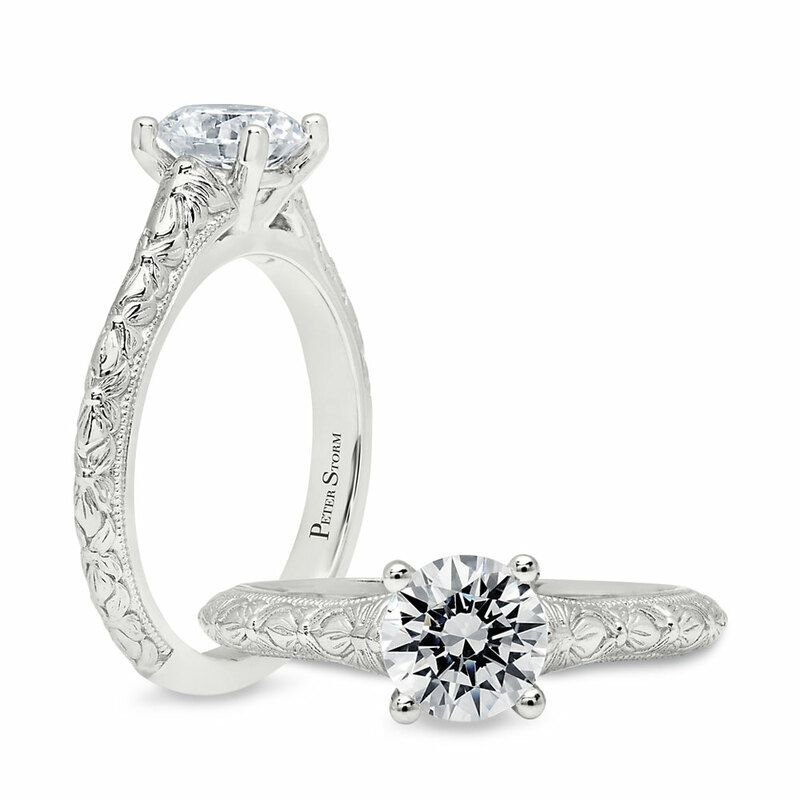 Peter Storm’s take on three stone ring: featuring engraving and diamonds that wrap around a knife edge band. Special detailing on the head create a beautiful profile on this ring. Available with Blue Sapphires. A solitaire head with a round stone. 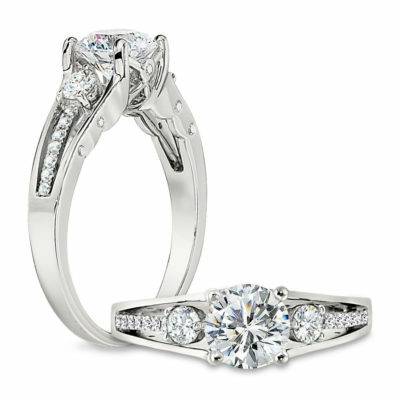 Subtle etched designs flow down the shank, surprise diamonds under the head add a touch of drama. Soft lines lay on the band climbing up to the center stone. Inspired by weaving Peter found in his trips to Italy. 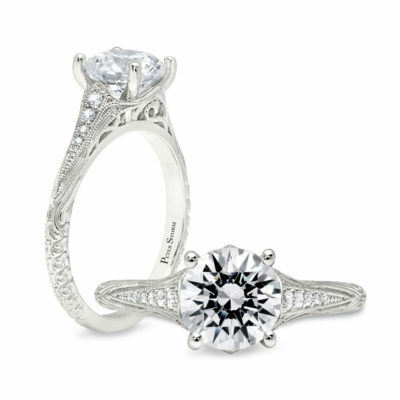 An excellent price point for your center. 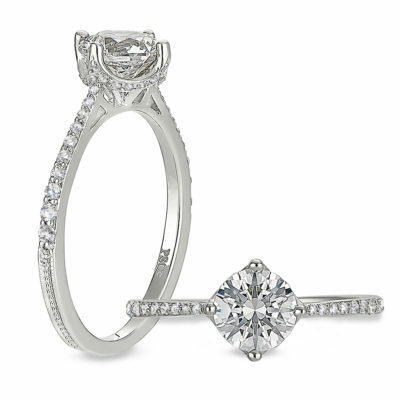 Three fingers of diamonds rise up to hold your center. 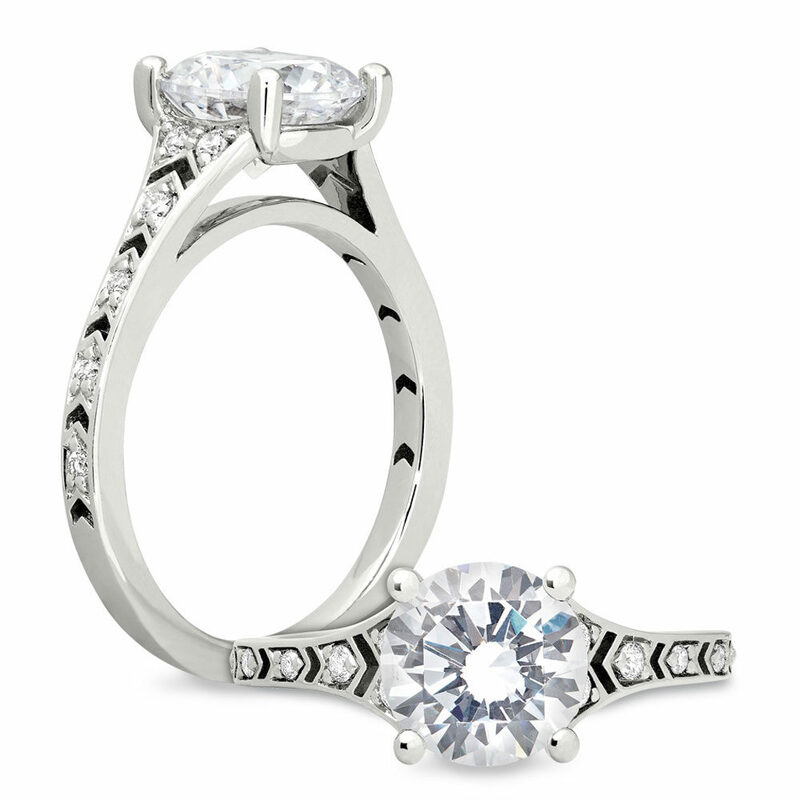 This ring boasts simple modern profile with graceful lines. Clean modern lines. 7 diamonds on each side of the center, with a 4 prong head. 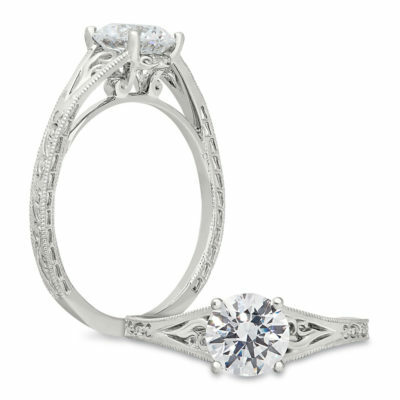 A classic design with charming details on the profile, beautiful from every angle. Elegant solitaire with delicate designs under the center. Solitaire with engraving etched with diamonds along the shank. Edwardian details combined with modern clean lines. 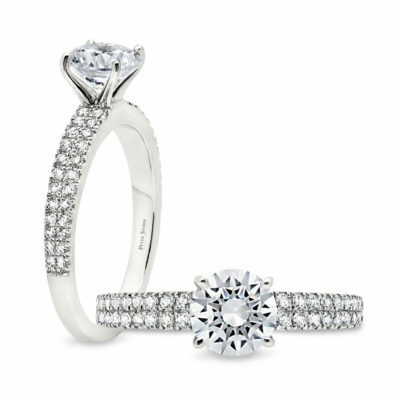 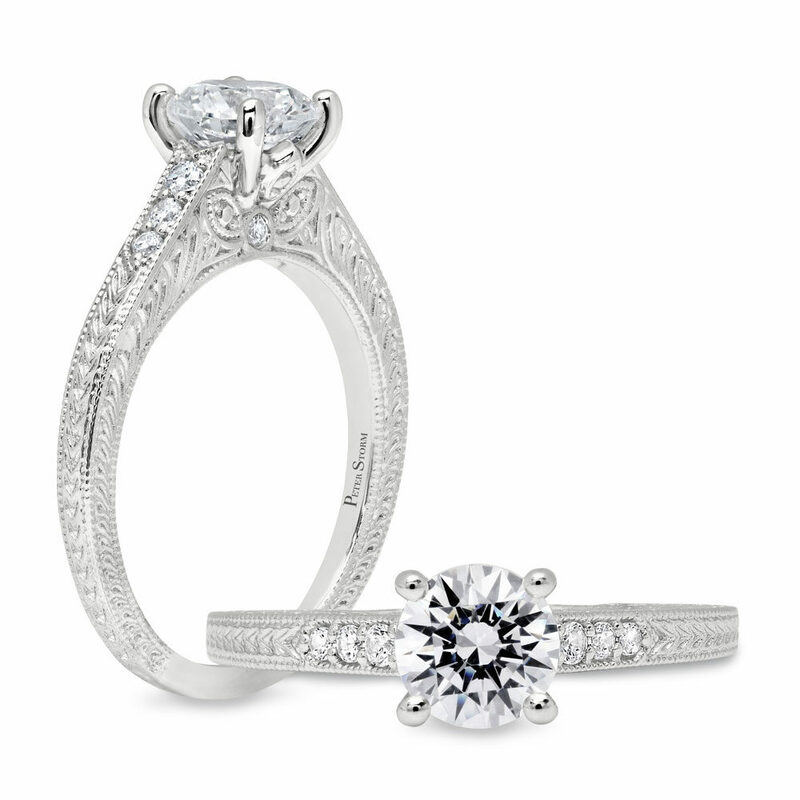 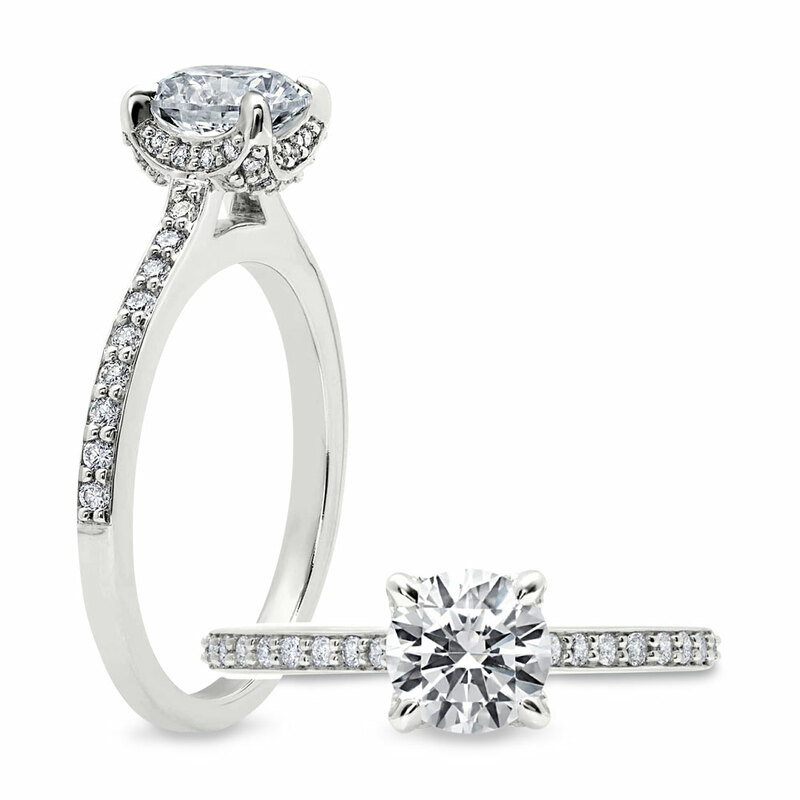 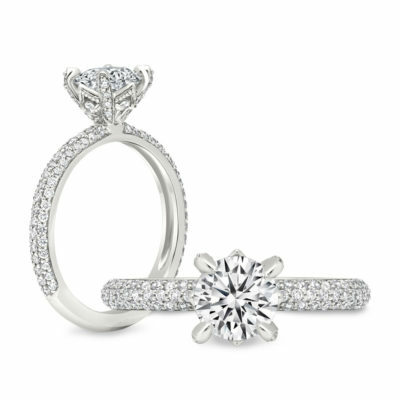 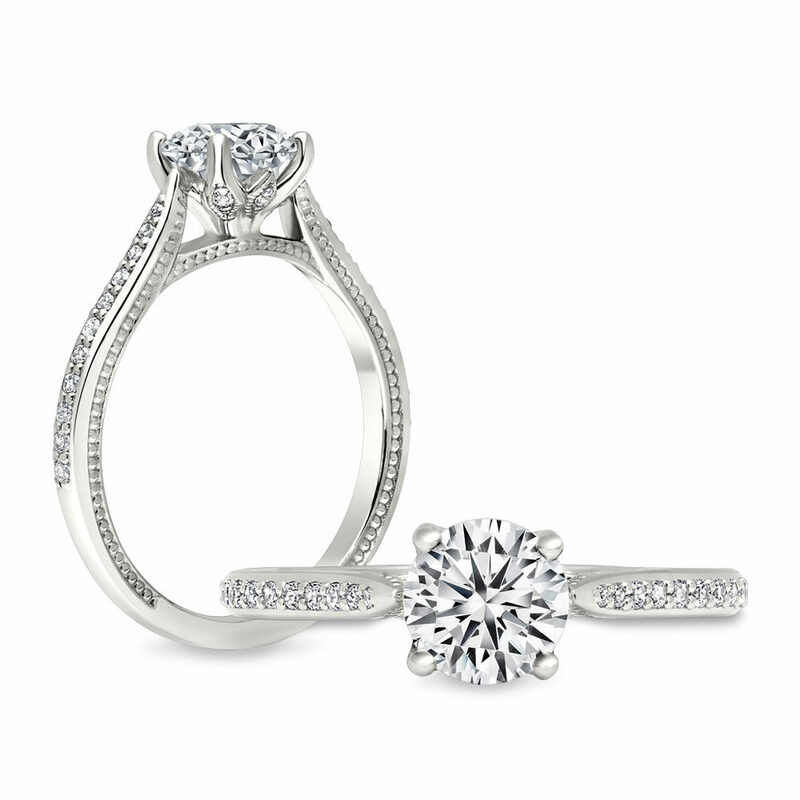 A twist on a classic solitaire, this ring rises to make the most of your center. Migraine edging adds detailing along the shank of the ring. 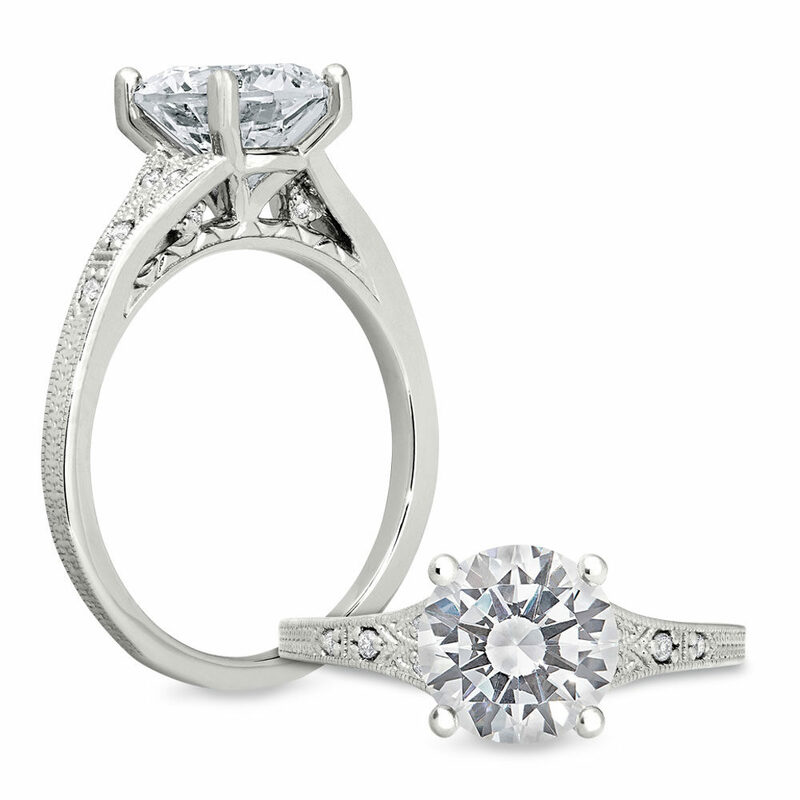 Perfect for a .5 to a 1.5ct center. 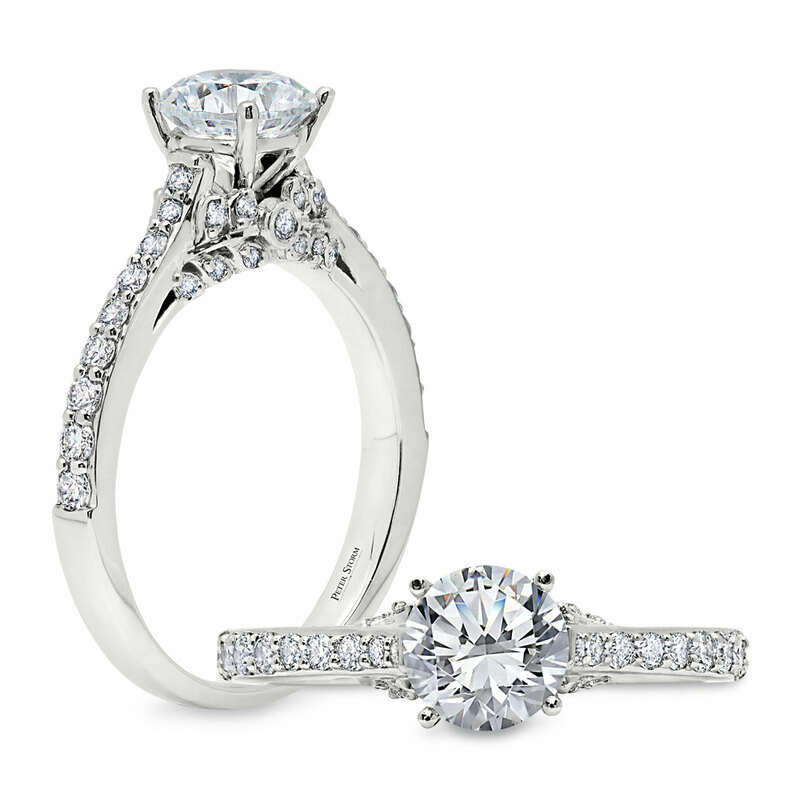 Utterly romantic, this ring is Peter’s take on a dramatic solitaire. Delicate designs around the head make it beautiful from every angle. Two round diamonds sit on either side o the center, a row of diamonds extend down the side of the band. 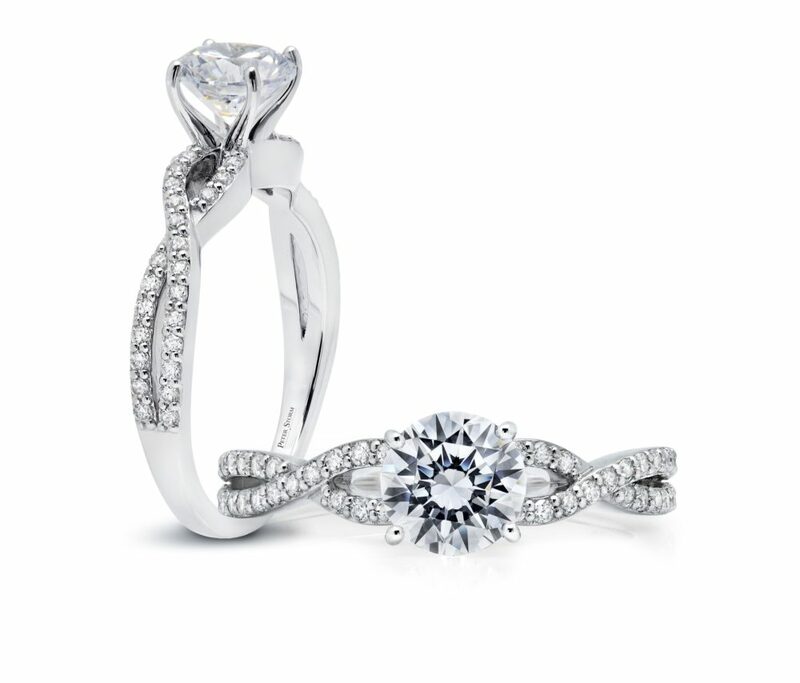 The profile features a wave design with four sparkling diamonds. The ring shines from every angle, showcasing a unique profile. 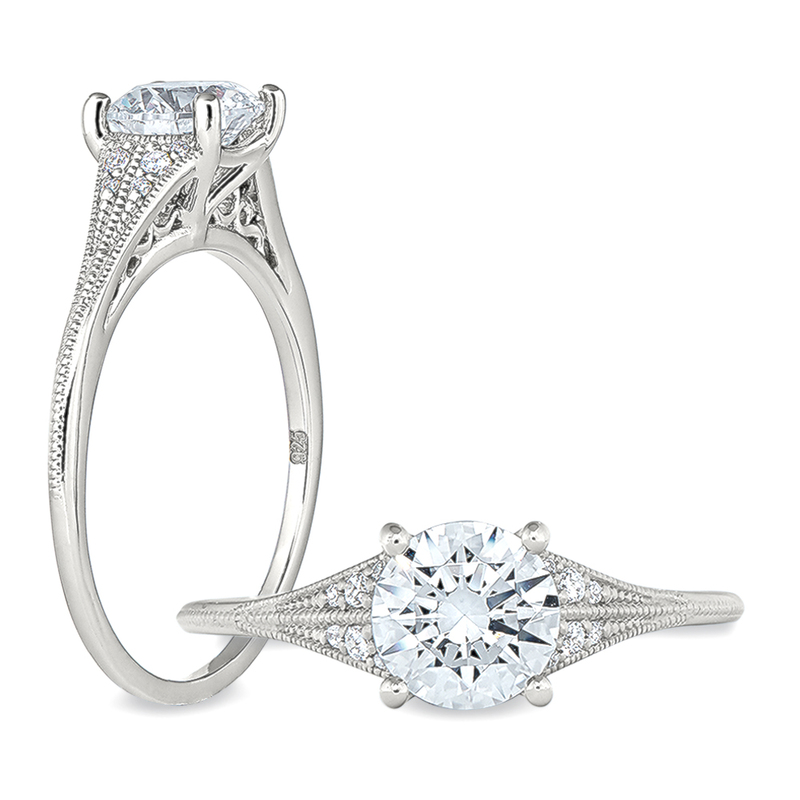 Scalloped diamonds make a design on the edge of the ring. Graduated diamonds flow down the band of the ring. 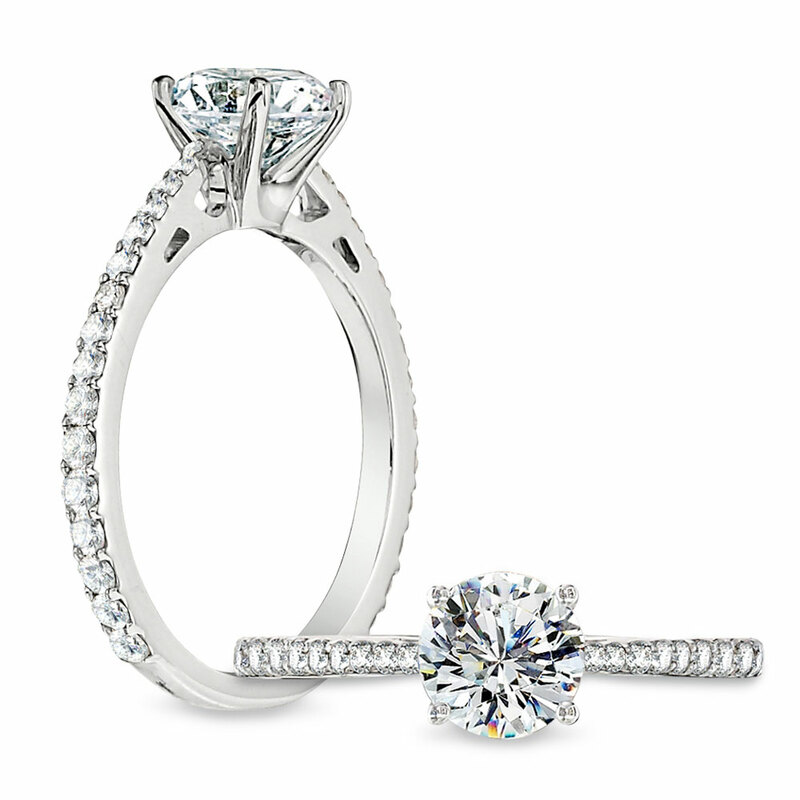 A classic take on solitaire, this crisp ring showcases two rows of sparkling diamonds. This ring looks beautiful with any shape center stone. 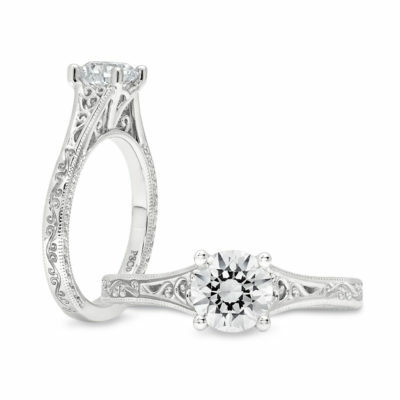 The floral design flows down each side of the ring, allowing the center to stand out. 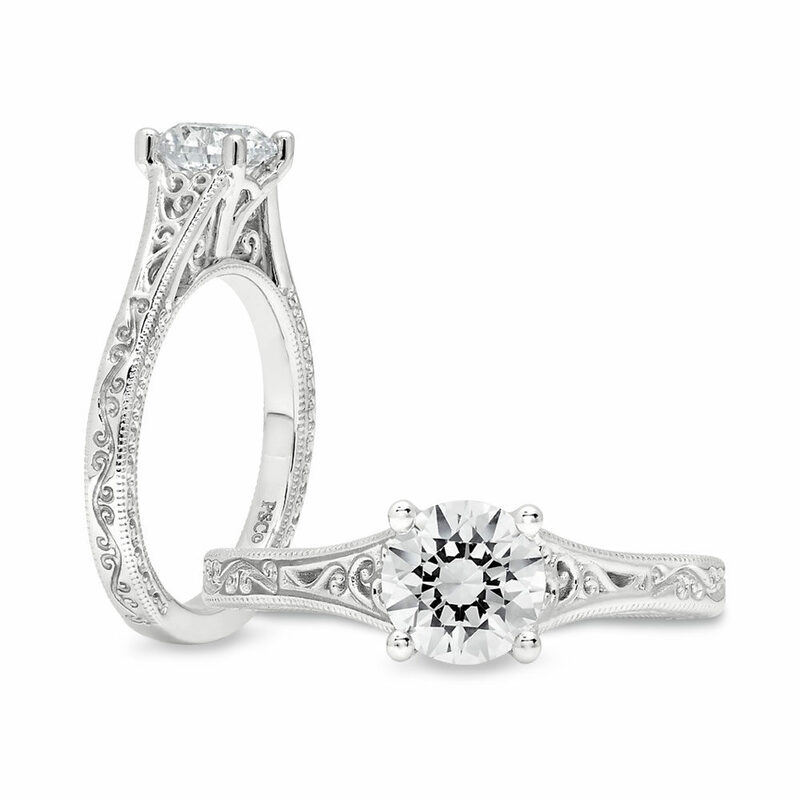 The flowers glitter and shine, a fun ring. 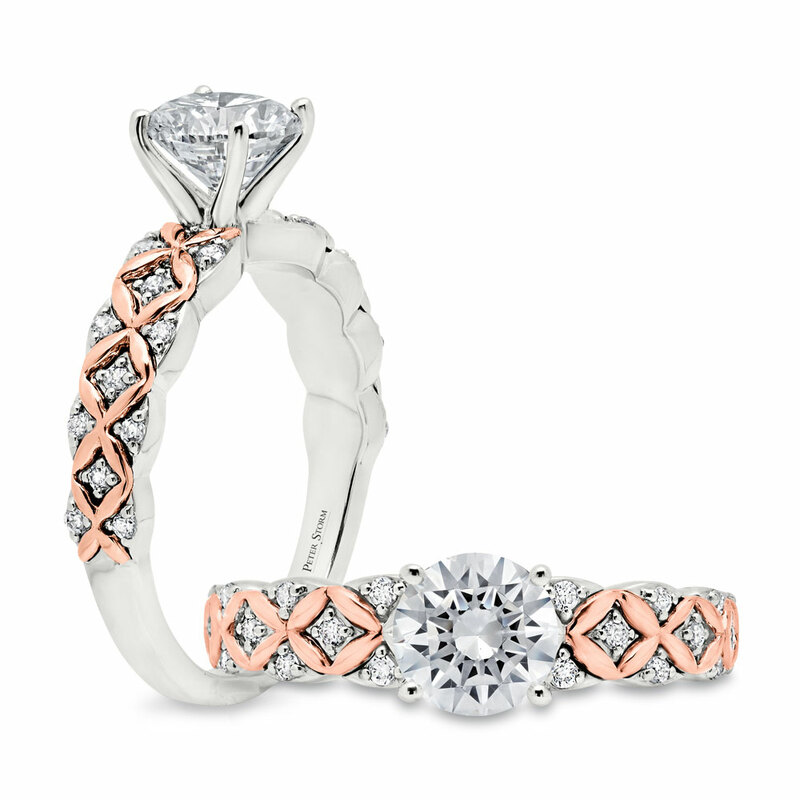 High polish rose gold diamond patterns intertwines with sparking diamonds. 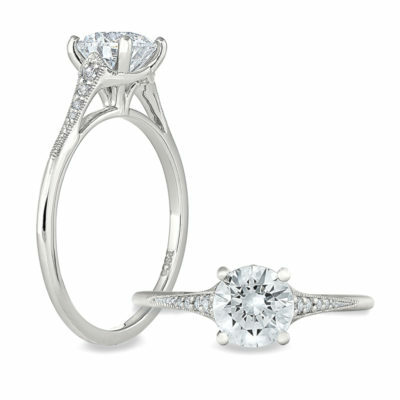 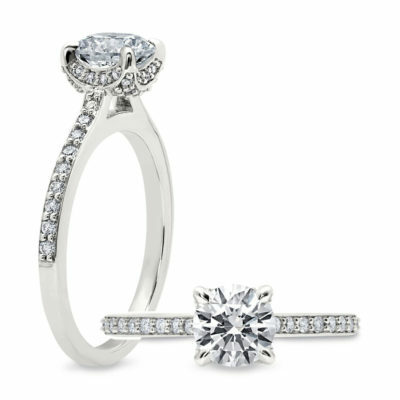 This modern take on a solitaire makes the most of your center stone. High polish yellow gold diamond patterns intertwines with sparking diamonds. This modern take on a solitaire makes the most of your center stone.